The Refectory & The Details Co. Styling — everAFTER magazine everAFTER magazine celebrates and inspires a couple’s journey from their engagement through to their wedding day and beyond including lifestyle and travel. Wedding venues, bridal, fashion and styling inspiration. The Refectory & The Details Co.
Planning & Styling by The Details Co. Photography by Handcrafted Pictures Co.
Be inspired by the immaculate style and design of this wedding created at The Refectory, Werribee Park by The Details Co. The Refectory Werribee Park is a heritage venue boasting classic charm and set within the historic Werribee Park. Nestled in 10 acres of formal gardens surrounding the grand 1870s mansion with its beautiful façade and distinctly Italianate architectural style, The Refectory welcomes modern touches and the allure of old grandeur. The Refectory combines heritage features, designer chandeliers, high ceilings and contemporary furnishings. 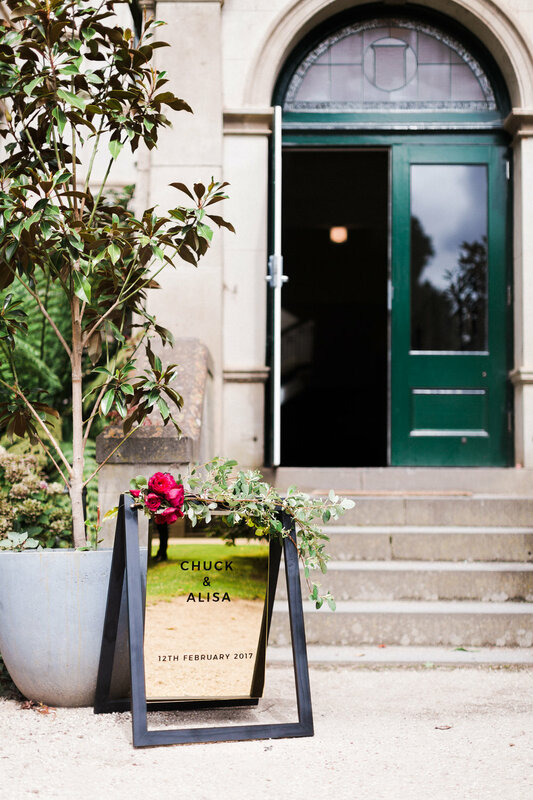 "Werribee Park is an absolutely stunning venue," said Founder and Creative Director Lily Goh of The Details Co. "It is romantic, a little moody and oh so glamorous. We knew we wanted to keep the styling classy and add just a touch of glitz." "The ceremony was held in the gardens. We often design and build ceremony arbours, however for this wedding, after seeing how naturally beautiful the area was, we didn’t want to distract from it. Instead, we decided to bring in clear acrylic plinths for the floral sculptures to sit on." 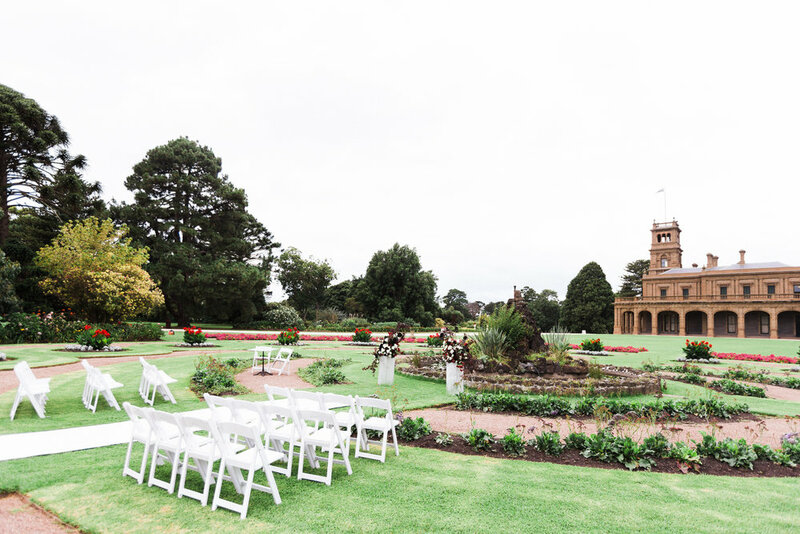 The wedding ceremony was held in the Parterre or formal gardens of Werribee Park. ‘Parterre’ is French meaning ‘on the ground’. The geometrically designed floral displays of Werribee Park's Parterre are best viewed from Werribee Mansion's balcony. The gardens contain approximately 20,000 annuals planted every six months. "Our brief from the bride and groom was to create a classy, Gatsby-inspired wedding theme. From here a colour scheme of red, gold white and black was chosen. We used gold mirrors in the signage detailing (with some laser-cut detailing), and gold cutlery and crockery added to the 'glam factor'." Garden-inspired floral designs incorporated red, deep red and white and worked harmoniously with the surrounds. At the altar, sculptural floral designs sat atop acrylic plinths. "The florals took on free form shapes with a sense of movement and grandeur. The flowers were equally bold and dramatic for the reception with large, lush sculptural floral formations adorning the centre of a long bridal table and nine circular guest tables." Styling advice from The Details Co.
Have a clear idea of the style and look you want and plan everything around it. This will help you make decisions and avoid confusion, especially when there are so many options to choose from! Don’t try to do everything yourselves, especially on the day of the event. This is what suppliers like us are here for - to help lighten your load and to make sure everything comes together beautifully on your wedding day, so you can just enjoy taking in every single detail.